I got to try out L’Occitane‘s Immortelle Brightening Skincare range and was really impressed with it! This is my first time using L’Occitane’s skincare products.. I’ve always known L’Occitane for their hand creams and fragrances, but I was pleasantly surprised to find out about their skincare range! What I really like about L’Occitane is that L’Occitane places alot of emphasis on using natural ingredients that are proven to be effective, and replaces or limits the concentration of parabens, chemical sun filters, phthalates and silicones, so that it’s less harmful and also suitable for sensitive skin like mine! This range is specially formulated with two ingredients that help to effectively combat anti-aging: the Immortelle flower and Bellis Perennis, a species of daisy. Here’s the range of products I was given to try: Immortelle Brightening Foaming Cleanser, Brightening Mist, Brightening Essence and Brightening Moisture Cream. I have been religiously using these products for the past one week plus, and I have to say that I really enjoy using them! A little background on my skin: I have combination skin type with oily T-zone and dry cheeks, and I think I’m probably suffering from every known unwanted skin issue ever to plague mankind! 🙁 I have sensitive skin that’s dull and tired-looking, broken capillaries/veins all over, clogged pores especially on my cheeks, pretty bad pigmentation and recently had a bad case of breakouts on my cheeks and chin. Also, I’m already past the age of 25.. If you didn’t know… women start aging at the age of 25 so it’s time to step up your anti-aging regiment to fight against those wrinkles, fine lines and saggy skin, ladies! Remember, prevention is always better than cure! 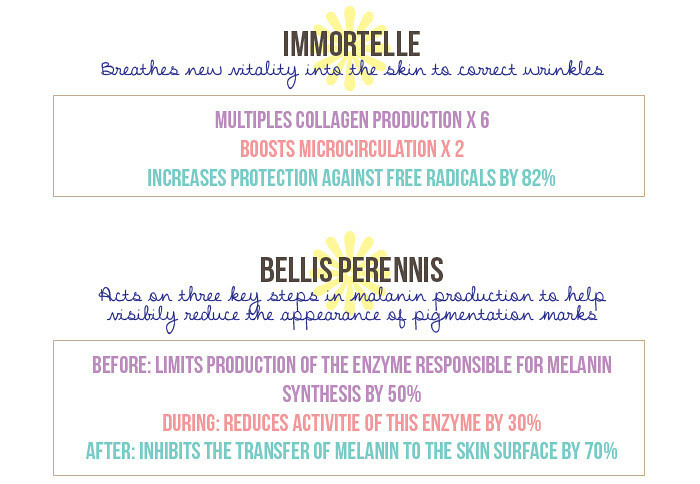 Enough of my rambling on, here’s my review on the Immortelle Brightening Skincare range! The Immortelle Brightening Foaming Cleanser is a soap-free, non-drying facial cleanser that takes care of the skin every day. Its creamy texture transforms into a rich foam that effectively removes impurities and make-up, revealing fresh skin and a luminous complexion. It combines Immortelle essential oil to help smooth the skin, and Bellis Perennis brightening extract to even out skin tone and illuminate the complexion. Fresh and perfectly cleansed, the skin feels soft and comfortable. The complexion looks even and luminous, with a radiant, youthful glow. The Immortelle Brightening Mist is an alcohol-free toner enriched with Immortelle floral water and Bellis Perennis that helps refresh, soften, illuminate and refine skin’s texture. It can also be sprayed onto the skin after make-up application to help make-up stay in place all day. The Brightening Mist is super refreshing and I love the sensation of spritzing it onto my face 🙂 You can either spritz it straight onto your face (recommended for mornings), or onto a cotton pad after which you use to pat the product onto your face (recommended for nights). It feels extremely gentle, and leaves my skin feeling soft and refreshed! Sometimes, I even spritz it on after I finish applying my makeup, just to set my makeup and keep my makeup fresh looking! Immortelle Brightening Essence is a serum that corrects wrinkles, evens skin tone and brightens the complexion. Its aqueous texture enhances the penetration of Immortelle essential oil, which stimulates collagen production and fills wrinkles. The Brightening Essence has a light-weight texture that is absorbed into the skin very well, and application is easy. I just use the dropper to drop a few drops onto my palm before patting it into my face gently! I love how light-weight and easily absorbed it is. It leaves my face feeling brighter and smoother instantly as well! The Brightening Moisture Cream offers triple action benefits to correct wrinkles, even skin tone and brighten the complexion. Immortelle essential oil stimulates collagen production to fill wrinkles and firm the skin* for a more youthful complexion. Bellis Perennis extract and a Vitamin C derivative reduce the appearance of age spots to even skin tone. My favourite product in this range has got to be the Brightening Moisture Cream! The texture is light and velvety, and it practically melts into my skin upon application, leaving it feeling extremely hydrated and moisturised. A small amount goes a long way. Love it! My only gripe about this is that it can be quite difficult to get the product out from its tub packaging without using a spatula. Still, definitely one of my favorite moisturizers to date! After using the Immortelle Brightening Skincare range for just seven days, I could see an improvement in my skin already! 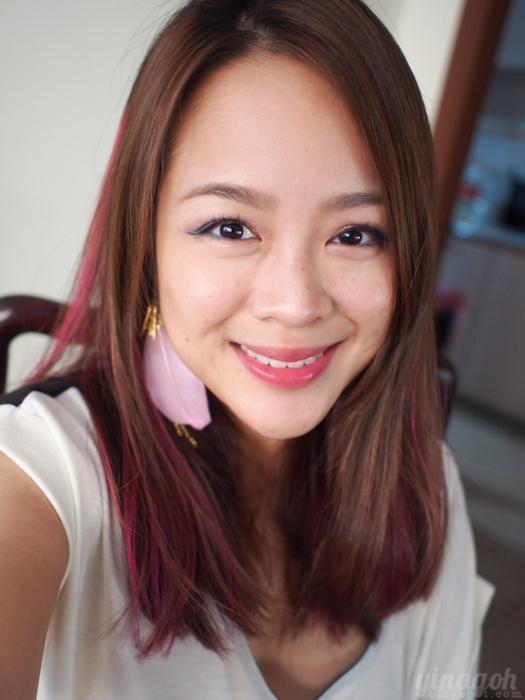 I noticed that my skin tone looks brighter and slightly more luminous after just seven days of application! My skin also feels more moisturized and plump, yay! 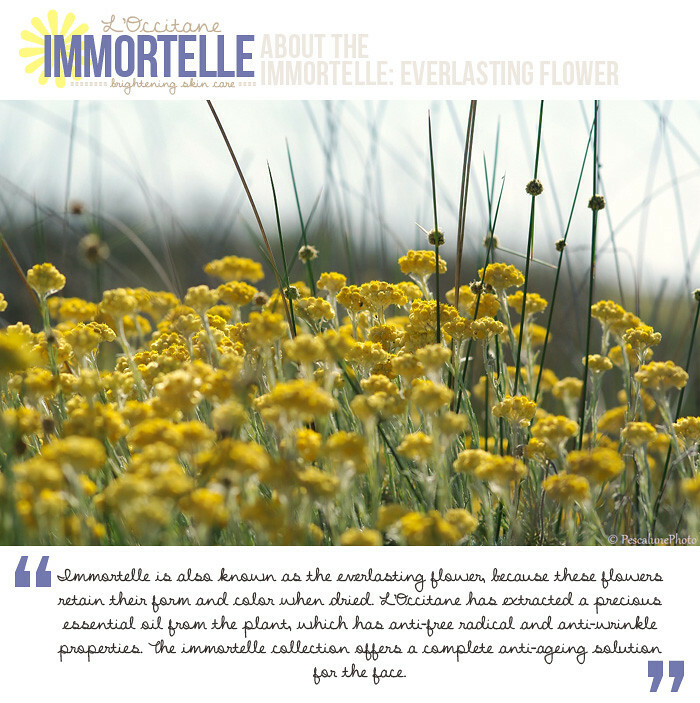 My favourite part of the Immortelle Brightening Skincare range is how light-weight all the products are, and I adore the fresh summery floral scent of this range as well. As you can tell from my bare-faced pictures that I’ve courageously put up, I have pretty bad blemishes on my cheeks and chin from my breakouts 🙁 The Immortelle Brightening Skincare range did not do much to improve the condition of my breakouts, but it did not break me out further or worsen my breakouts, but helped to calm down some of the redness and lighten some of my blemishes just slightly. I also find that my makeup goes on better and more smoothly than before! I’m definitely going to continue using this range, and I hope to see even better results! 🙂 The Immortelle Brightening Skincare range is already available at all L’Occitane stores in Singapore, so do pop by to check it out! 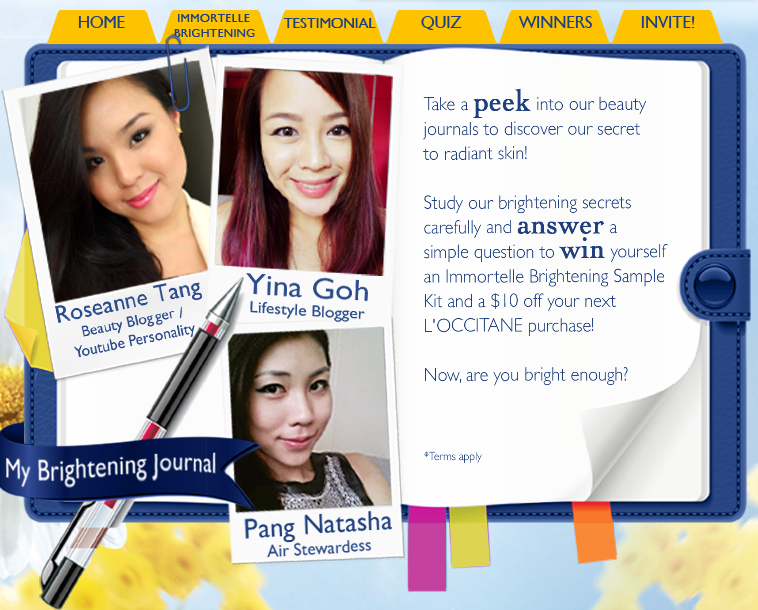 For more information on the Immortelle Brightening Range and other L’Occitane products, do check out their Facebook page here! 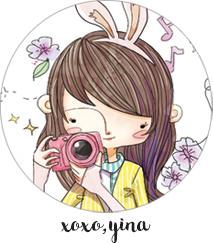 😀 Also, there’s gonna be a cool Facebook app featuring meeee that’s launching on L’Occitane’s Facebook page some time this week, so you gotta go check it out! Have an awesome week ahead, folks!